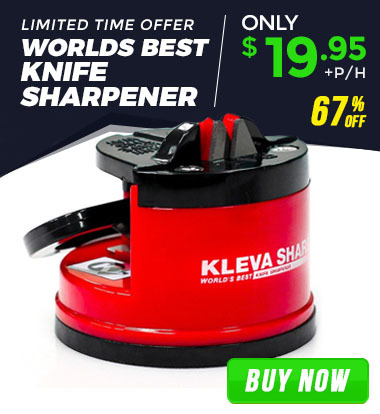 Kleva Sharp The Original Worlds Best Knife Sharpener! 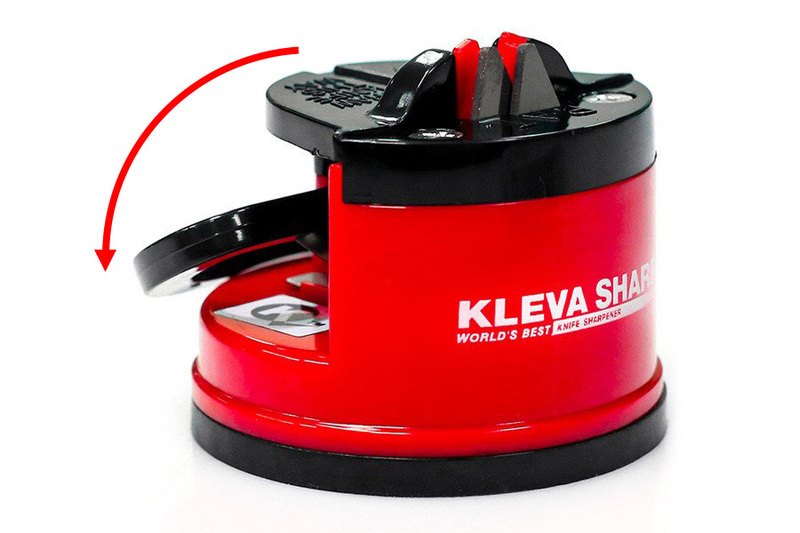 If you’re sick of having a drawer full of blunt knives and struggle with old fashioned sharpening tools, then you need the original tried and trusted, Kleva Sharp™ Knife Sharpener. 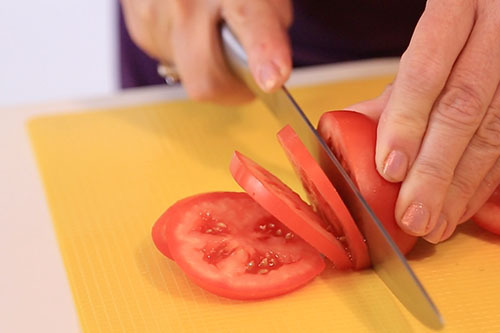 Replace the edge on your old knives without having to buy a new one! 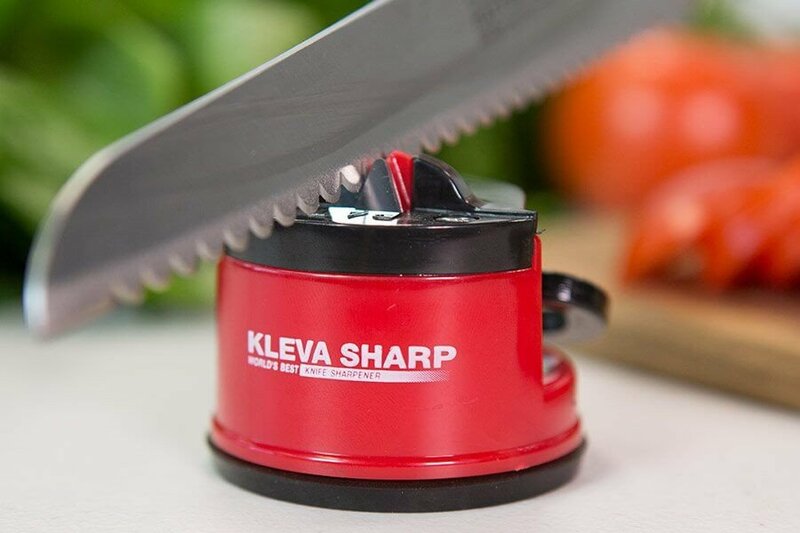 The Kleva Sharp™ Original sharpens all knives in seconds, giving you the perfect blade whenever you need it. 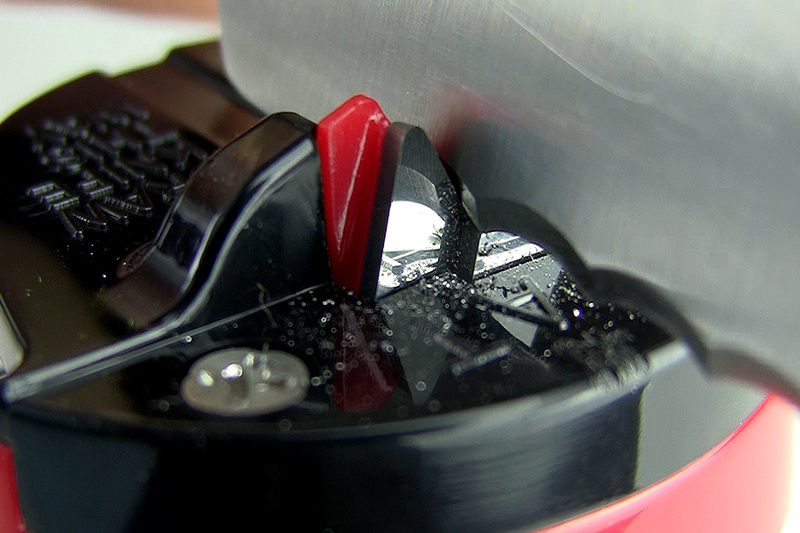 Sharpen serrated edge blades, even hardened steel blades. The tungsten carbide technology is precisely positioned at the right angle to make sharpening your knives fool proof and effortless! Look for the Kleva Quality Seal, and you will know it’s real. I love this sharpener. You push the lever down, it grips onto the bench and away you go. So far I have sharpened every knife in the house and every pair of scissors. The only thing that has slowed me down is that I can’t find the shed key so I can try it out on the garden and the hubbies woodwork tools. It is so good that I am going to buy every one in the family one for xmas. This is the best sharpener I have ever used. I give it 6/5 stars and I highly recommend it. I have a nice set of knives that my husband gave me a few years back. But, the best knives are no good unless they are sharp! This product works. It’s small – small enough to fit into a drawer and not take up counter space. But it does exactly what it needs to. It is very easy to suction it on the counter. Do it with the little lever coming toward you – I wasn’t sure at first. Once it is stuck to the counter, just pull the knives through the mechanism three or four times and you will see a huge difference in the knife performance. The Kleva Sharp™ had tungsten carbide teeth, perfectly positioned to give your knives the sharpen they need. Suction the Kleva Sharp™ down, and test it is secure. Simply run your knife through the teeth in the direction outlined on the product. The Kleva Sharp™ will remove the old edge, and create a new, sharper edge. 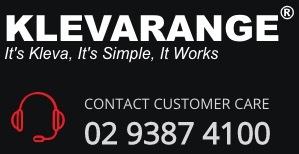 The Kleva Sharp™ comes with a 2 Year Warranty. COPYRIGHT 2017 KLEVARANGE, ALL RIGHT RESERVED.